I love Leilani Münter and her green vision for our world but there is already a new green NASCAR team on the block. 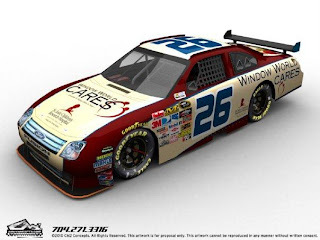 Vermont businessman Bill Jenkins, owner of Latitude 43 which is an organic cleaning products company, has purchased the #26 number from Roush Fenway Racing. The transaction includes racing equipment plus 2009 owner points, meaning that the new team will automatically qualify for the first five NASCAR Sprint Cup races in 2010! Green Team Latitude 43 Motorsports is looking for Sponsorship Partners for 5 upcoming NASCAR races: Daytona, California, Las Vegas, Atlanta and Bristol! What an amazing, green media buy! Just think what an impact there would be on our planet if the millions of NASCAR fans became educated about green living, made changes and shared what they learn with others. This is a perfect way to shout the green message. Don't tell me that NASCAR and green are an oxymoron until you ditch your SUV, stop flying grandma in for visits and oh yea and stop emitting carbon dioxide with every breath. 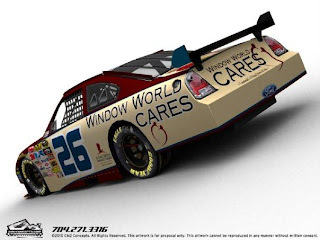 Please let me know if a green NASCAR sponsorship is something you think your company would be interested in and I will get your information to the Sponsor Acquisition Rep. Please also pass this on to anyone you think might be interested in this opportunity.